Well done Tony on picking this up. I was out last night at the opening of of Crayford Astro's new observatory at Sutton-at-Hone near Dartford, Kent. About 70-80 people were there and many had a good view of the comet in various binoculars and telescopes only a mile or so from the M25. It was very claggy in Chelmsford before I left but I took the risk of leaving a DSLR and telescope taking images in the garden when I went out. By the time I got back it had clouded over completely so I didn't get a chance to point my main scope at the comet but the DSLR/Megrez did get some images. This stack just about shows the faint tail and disconnection event. As always, the latest images submitted to the BAA are here. I managed to get a similar result from Edgware in a claggy sky early on Thursday evening before it clouded-up. The disconnection is just about shown despite the LP gradient. R Ligustri's image on Spaceweather is pretty stunning. Really amazing and stunning images there guys, well done indeed. Excuse my ignorance but what causes a “Tail Disconnection” event to occur or is it well understood? The faint tail of this comet consists of gas which has come from the nucleus and which has been ionised by sunlight. This ionised gas is called a plasma and it is affected by the magnetic field that is carried along by the solar wind. Gusts in the solar wind can compress the magnetic field lines in the ion tail so that they effectively short circuit releasing a lot of energy that can sever the tail from the head. The image below is from tonight and it has a field of view of 2.3x1.7deg. There is a lot of structure in the ion tail and this provides a direct measurement of the interplanetary magnetic field in the vicinity of the comet. Thanks Nick for that interesting information and your impressive wide-angle image of comet Lovejoy. I did some visual observing tonight with 10x50 binoculars, although it had the appearance of just a fuzzy patch I do believe I seen an associated greenish colour but it was very subtle. Looking forward to more stunning images of comet Lovejoy! The tail of this comet really does change dramatically from day to day. One of the advantages that we have now is that we can get images taken from around the globe and this allows us to get really good time resolution. The images below are all from the last night and they show tail changes over a matter of hours. Please, please, please, if you are submitting images include field of view/scale and orientation info. Without this we need to do a lot of guessing when we rescale images to look at things like this. Thanks for the analysis Nick! 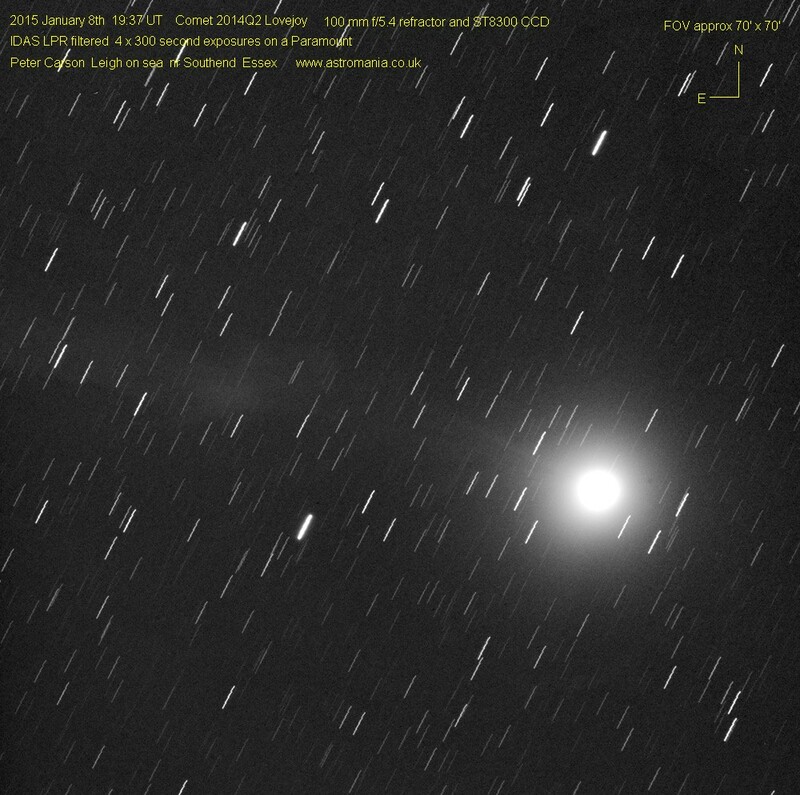 Last Saturday night, January 10, I left a camera running taking 60s images of this comet. I have now stacked these into groups of 20 and made an animation from the resulting 8 frames. The mid-times of these frames are from 2015-01-10 17:54:38 to 20:27:34 so just around 2.5 hr. The FoV is 68'x52' with approximately N up. If you look carefully you can see motion of features down the tail over this short period. Here's another comparison of the tail from two stacks of images taken tonight around 6 hours apart.